Now that Tom and Matt have both posted multiple times, the pressure has been building for me to set aside whatever else I’m working on (yes, “working” — somebody has to keep this place going – do you think Tom Bloom remembers to send us artwork all on his own?) and write something. And this isn’t just ANY blog entry, it’s my first. Matt already did a welcome. Tom already reported on the Boston Book Fair (and he wasn’t even there). At a loss for anything more interesting, you get the minutiae of the kind of nonsense problems that keep me busy here at BTC. In preparing a mini-catalog of our Mark Twain inventory, I wanted to keep all the editions of Huck Finn together. We have over forty entries in our database, with about two dozen different rare and used copies in stock at the moment. 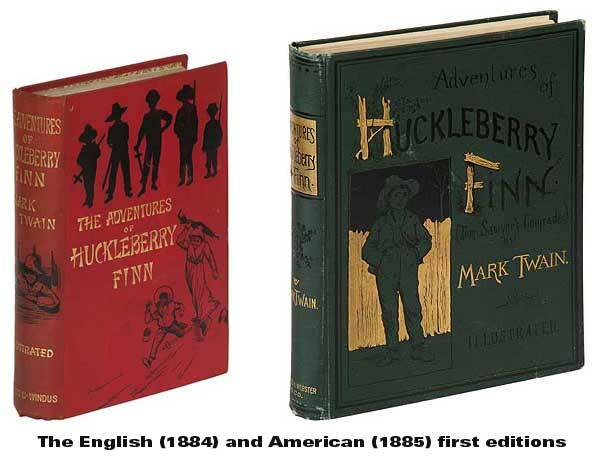 Some are listed as Adventures of Huckleberry Finn and some are listed as The Adventures of Huckleberry Finn. I like our catalogs to be consistent. Consistently good, consistently bad, I don’t care. Just consistent. I know Gertrude Stein famously said of Oakland, California, that “There is no there there.” So this afternoon I went in pursuit of the answer regarding The Adventures of Huckleberry Finn – is there a “The” there? Fine, so the title page of the first edition of Huck Finn should give the definitive answer, right? Unfortunately, no, not so fast. 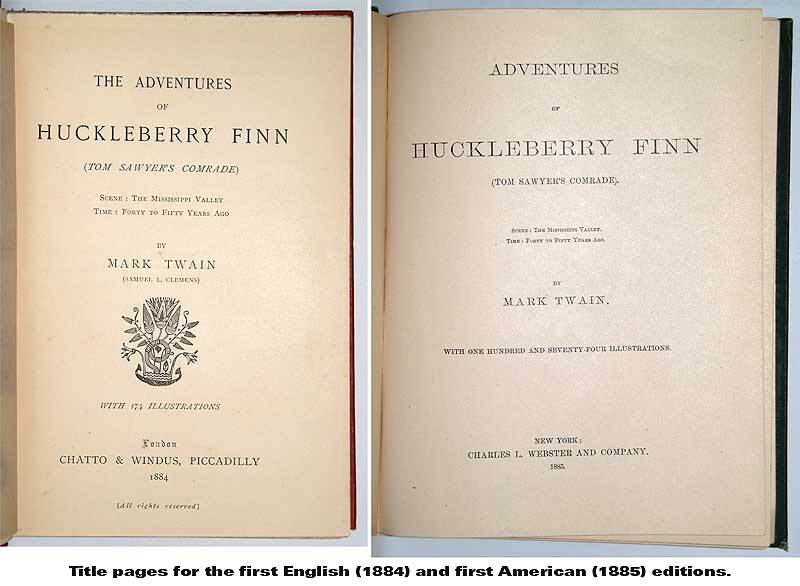 Huck Finn, one of the key contenders for the title of The Great American Novel, was first published in Great Britain by Chatto & Windus, two months before the American edition came out. We happen to have nice copies of both in stock at the moment that you can even view in 3D on our website [subliminal advertisement: you want to buy these books from us], allowing for a quick first-hand check of the title page(s). And herein the problem begins. 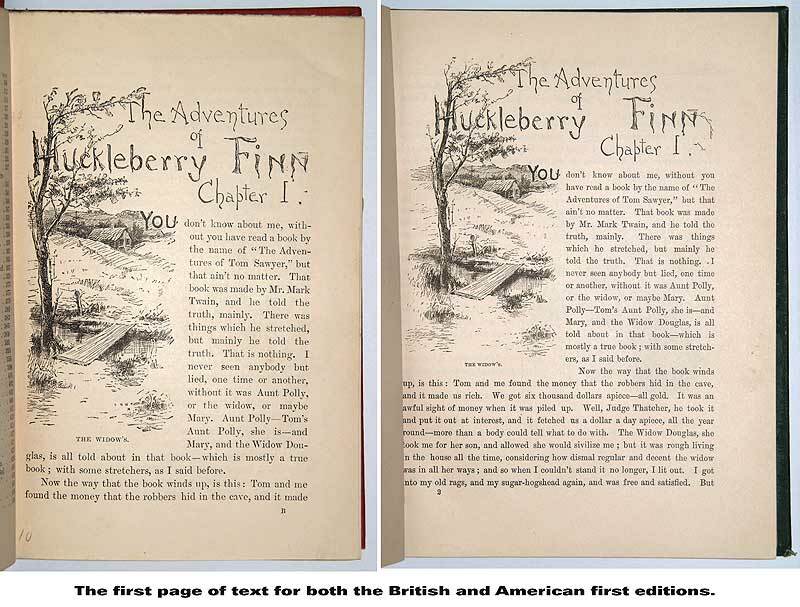 On the British, TRUE FIRST EDITION, the title page (and cover) says “The Adventures of Huckleberry Finn.” On the American first edition (yes, a copy with the all the important first issue points – don’t get me started on those) the title page (and cover) is simply “Adventures of Huckleberry Finn.” And, further, on BOTH first edition issues, English and American, the first page of text is entitled “The Adventures…” So far, it looks like “The” is winning. But then I noticed on Wikipedia that “Unlike The Adventures of Tom Sawyer, Twain’s Adventures of Huckleberry Finn does not have the definite article ‘the’ as a part of its proper title. Essayist and critic Philip Young states that this absence represents the ‘never fulfilled anticipations’ of Huck’s adventures—while Tom’s adventures were completed (at least at the time) by the end of his novel, Huck’s narrative ends with his stated intention to head West.” Like everyone else, I trust Wikipedia on everything, except all the stuff that I know to be erroneous (I used to try to make corrections, but really, who has the time when Tom Bloom needs to be reminded about an art deadline and there is a blog entry to be written?). 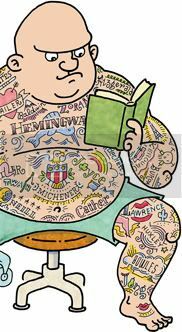 Young was a respected American literature scholar who specialized on Hemingway, and like most literary scholars he probably would have starved to death if he hadn’t kept making and publishing seemingly important critical additions to the canon of American literary theory. I’m not saying he was overreaching a little here – he probably researched more about Twain’s intentions when writing Huck Finn than I have. But maybe, just maybe, he never even checked to see if the missing article was deliberate or not. Many a new theory is based on an intelligent mind assiduously applied to incomplete evidence. Twain’s been one of America’s most studied authors for well over a century. It wouldn’t surprise me in the least if some Twain scholar, at some point, traced through all of his correspondence and publisher archives and determined when and why the “Adventures” became “The Adventures.” On the other hand, this is just the kind of pointless arcana that, in my experience, often gets overlooked. Probably for good reason. [The] end. This actually doesn’t add to much to what I had already found – that is, Twain’s intention seemed to be to omit the definite article, but everyone else and even he himself was either confused or sometimes forgot this. If it was really important to him there would probably be more correspondence of him raising a stink each time it was included by mistake. But the Mark Twain Project edition also gave numerous citations in their note, providing fuel for those more intrepid than I.